Do you remember making your first paper airplane or paper crane? Do you remember the joy and excitement of learning and mastering how to fold your favorite paper-based creations? Although commonly known in Japan today as a childhood pastime, origami (折り紙) has evolved into a major medium for artistic expression, with leading artists transforming simple geometric shapes into awe-inspiring imaginative forms. Many Japanese people have fond memories of their first origami experiences, often having honed their basic skills in elementary schools where they learned to create paper animals, planes, and other objects with friends and family. At its essence, origami is the traditional Japanese game of folding elaborately designed paper into a myriad of shapes, typically plants, animals, and other living things. While the original rules for ancient origami were less strict, the formula for modern origami always requires a square sheet of paper with no cuts, glue or markings during the folding process. With even a small number of basic folds anyone can create intricate designs. The type of paper selected is also another important ingredient in any origami creation. The color, thickness and porosity of the type of paper used will influence the crafter’s desired visual effect. Part of what makes origami unique is the fact that it simply requires a piece of paper and a creative imagination. Where did origami come from and why is it so popular? A deeper exploration of the origins of origami and its evolution provides enlightening insight into the popularity of this craft, showing that it is not merely child’s play, but a medium for profound artistic expression. It is believed that origami was first introduced to Japanese society soon after the invention of paper, which originated in China. Early paper making techniques and paper products were imported into Japan by entrepreneurial Buddhist monks who brought the technology over from China during the Heian Period (794-1185). Early origami creations were reserved strictly for religious purposes due to the high price of paper. Not took long after its introduction into Japan, origami quickly spread and became a traditional cultural practice. Considered an elite skill, Heian nobles secularized the practice of folding paper by using luxuriously rendered chiyogami (千代紙), washi paper that has been hand stenciled or printed with bright, colorful traditional Japanese floral imagery, in gift-wrapping. In the ancient Japanese Imperial court, origami served as an an elegant yet amusing leisure activity. Eventually origami developed widespread appeal, and ultimately the practice transformed into an indispensable part of everyday life. The crane, or tsuru (鶴), is known to represent longevity. The famous clusters of origami cranes strung together is known as senbazuru, meaning 100 cranes in in Japanese (千羽鶴). Origami’s influence on art and society was by no means restricted by national boundaries. By the early 20th century, international artists began to incorporate origami or origami-inspired folding techniques into their works. One artist, Akira Yoshizawa, had a particularly significant effect on the craft’s evolution into a sophisticated art form and highly cultured contemporary practice. Yoshizawa is well-known among origami enthusiasts for having created the practice of “wet-folding” (ウェット・フォールディング). This technique facilitates the manipulation folding paper, giving origami shapes a more sculpted look, as opposed to a purely geometric one. He also is one of the creators of the Yoshizawa-Randlett diagramming system, a groundbreaking method of diagraming origami folding instructions. Yoshizawa’s genius inspired a renaissance in origami art and played a major role in its internationalization. Origami can also be found in widely-known stories from Japan's history. In the aftermath of the World War II, a young 12-year old girl named Sadako Sasaki fell ill after being exposed to radiation caused by fallout from the atomic bomb dropped on Hiroshima in 1945. There is a famous Japanese legend that says that, “the one who creates a thousand origami cranes will earn one wish.” Bedridden and suffering from leukemia, Sadako decided to fold one thousand origami cranes in hopes that she might survive. More than anything, Sadako simply wished for a long, healthy life. 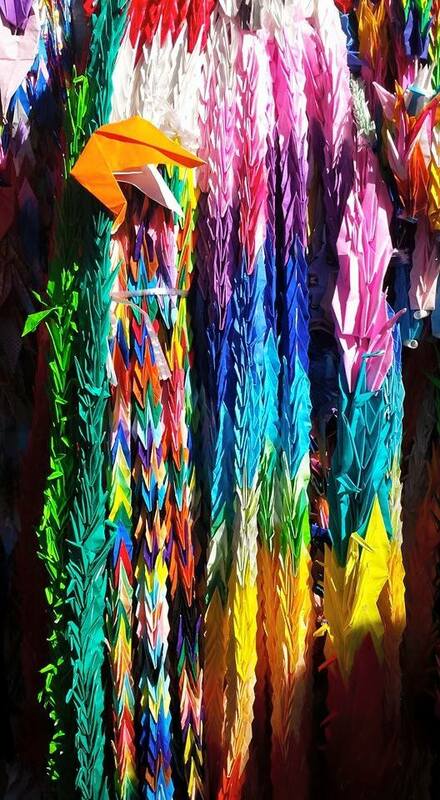 Realizing that she would never recover from her illness, she instead dedicated her beautiful cranes to world peace. Sadako managed to fold only 644 paper cranes before she died. Family members, classmates and friends completed her origami project in her honor, and later buried her shrouded in a wreath of one thousand paper cranes. Today, a large statue of Sadako stands prominently in the Hiroshima Peace Park as a testament to her touching story about life, death and peace. Her melancholy tale played a major role in transforming the paper crane into an important symbol of peace and Japanese culture. Although it is ever-present, few ever mention origami’s unique aesthetic philosophy as contributing to its appeal. For example, origami celebrates the importance of minimalism in art. Reflected in the term, shibumi (渋味), which refers to a kind of understated beauty or simplicity, origami is often praised for transforming an unassuming object into something beautiful. The washi that origami is made from also reflects another element in Japanese aesthetics. Like life, paper is fragile and temporary, but origami artists attempt to harness it in a single, tangible form in hopes of creating something with a sense of permanence. Japanese origami craftsmen prefer to create likenesses of natural objects, such as flora and fauna, as opposed to non-living objects, which are more popular in other paper-folding cultures. Nowadays, contemporary artists who are inspired by Japan’s uniquely rich aesthetic tradition are able to construct extraordinary origami that is both dynamic and realistic, using this form of true haute artistic expression. From religious practice to artistic innovation, the craft of paper folding has become a substantial aesthetic medium in its own right, one that has influenced everything from architecture to footwear. In Japan and around the world, origami artists are increasingly attracting the attention of prominent small gallery owners and private collectors who are commissioning pieces that sell for thousands of dollars. Undoubtedly, contemporary master origami specialists will continue to create astonishingly original paper sculptures that transcend the typical exemplars of the humble craft and take it to a realm far beyond child’s play. With its ability to provide simple yet creative fun for children, as well as a complex and profound medium for artists, origami will only continue to inspire people around the world for years to come.